For those of you that follow me on twitter you saw my tweet about this but here's the story. 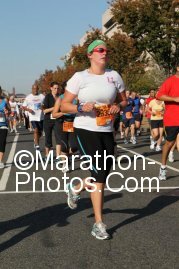 I ordered my 5x7 photo from the Army Ten Miler on 19 Oct. On 31 Oct I was told they shipped and it would be 2 weeks for the picture to arrive and in just under 2 weeks I received my picture. I promptly went out and bought a 5x7 frame for my new race photo got home and IT DOESN'T FIT! I spent 23 bucks on a picture that I can't frame?! In order to frame it at the size it is at 5x7.5 I would have to buy a custom frame. Frustrated I turned to contact the company, . They don't even have a number or email I can contact them in the US! WHAT?! So I entered into their automated system my frustration. I am very disappointed with the service of this company. It took almost 3 weeks for me to receive my photo. The photo I received was supposed to be a 5x7 and when it arrived it will not fit in a 5x7 frame and is actually 5x7.5. I would like a refund given the fact that the photo is not what I ordered! I am so unhappy I will gladly send the image back (if you provide a shipping code- I will not be charged to send back a photo I am not happy with). I look forward to your response. To have our quality control check this photo and possibly offer a replacement or refund, we need you to post back this photo. You might try writing "Return to Sender" on the original packaging to post back to us - please check the address is clearly as above. * Also, in case of a refund, please give a Visa or Mastercard number ( WITHOUT the expiry date). You have to be kidding me? I have to pay to ship back a photo that you obviously printed wrong and now you want me to just send you my credit card information. You have to be joking send your credit card number to a foreign country with a package. This is rule one in protecting your identity. I am appauled that this is the way you treat customers and I have sent a detailed email to the Army Ten Miler support staff explaining my issues. I will not be returning the photo and I will not be sending my credit card information for a POSSIBLE refund. I will never be ordering a photo from your company again and plan to let all my friends know that are athletes too to keep an eye out for your company in future events. Thank you. And best wishes in the future! I am awaiting a response from them. I will keep you posted with any further developments. I have sent my issues to the race directors of the Army Ten Miler, also. Just an FYI companies out there- you need to realize that customer service is bigger now than ever! In a second I can say don't use this company and my 800+ followers on twitter read it and one of them retweets it (@trirunner302) and you have your name disgraced to over 2000 people. Then add in the fact that @runteamsparkle put the comment in their newsletter and the reach goes exponentially. You just need to take the time to realize what you are saying and whether you want that out there in public because it is no longer I tell 2 friends I don't like you and it stops there. To be quite honest I didn't even realize how far my reach is but it is really worth while for companies to keep in mind especially with the economic times when people are worried about spending money and not having it be a worth while experience.